Aside from our survey, there is a lot of other science taking place on the ship. In fact, science is all around us. The officers on the bridge are using science when they use weather patterns and sea swells to calculate the best course of navigation for the ship. The survey technicians are using science when they collect water samples each day and test the salinity of the water. The engineers are using science when they are monitoring the ballast of the ship. Science is happening in places we don’t always take the time to look. Today we look at a different realm of science, the engineering world. 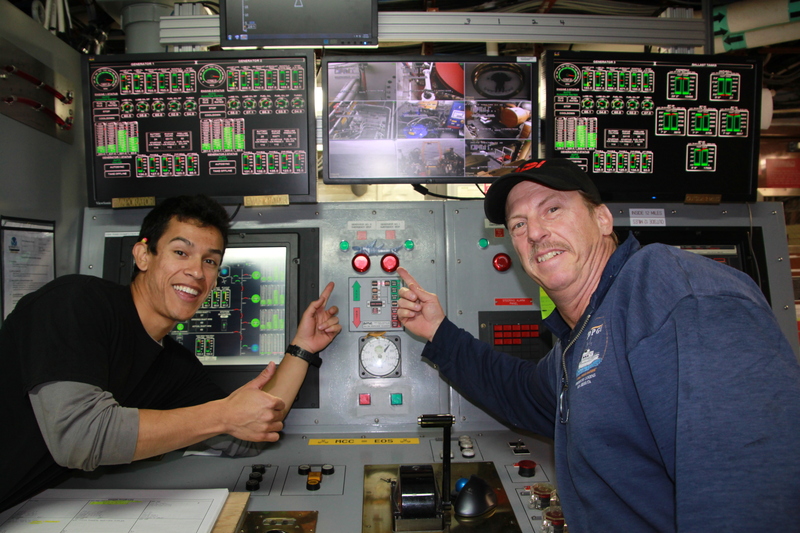 I recently had the opportunity to tour the brains of the ship with two of our engineers on board. I not only learned about the construction of the ship, but I also learned about the various components that help the ship run. The Oscar Dyson was constructed as one of NOAA’s first noise-reduced fisheries vessels. Data have been collected over the years that show fish avoid loud vessels by diving down deeper or moving out of the way of the noise. There was concern that this avoidance behavior would affect the survey results; thus the creation of acoustic quieting technology for research vessels. Another interesting part of the ship’s construction is the retractable centerboard, which allow the transducers to be lowered down below the ship and away from the hull in order to reduce noise and gather higher quality sound data for the surveys. It turns out 2 of our engineers are from San Diego, the place I lived for my first 21 years of life. Nick even graduated from Westview High School, the rival of my high school, Mt. Carmel (albeit 10 years after me). The engineers are responsible for making sure everything is working on the ship. They, along with the rest of the engineering team, have to anticipate and troubleshoot problems, and be ready to fix something at a moment’s notice. In addition to taking me on a tour around the innards of the ship, Nick and Rob also sat down for an interview about marine engineering. Nick: I played soccer throughout high school and was recruited during my senior year by the US Merchant Marine Academy. I went to school there, played soccer, and received a BS degree in marine engineering. I spent 1 of my 4 years at sea doing hands-on training. I was also commissioned into the US Navy as a reservist. Rob: I’m what they call a hawespiper in the merchant marine world- I started at the bottom and worked my way up. I started at Scripps Institute of Oceanography in 1988 and worked my way up ranks from oiler to engineer. I received my captain’s license, and ran sport fishing boats because I wanted to know boats from top to bottom. I went to professional college for refrigeration, and my main forte is refrigeration and air conditioning, I know I’ll never be out of work. I’m a first engineer now, and am going to go for my chief’s license. How long have you been working on the Oscar Dyson? Nick: I came on in August of 2014. What are your main responsibilities as an engineer on board? Nick: As a second engineer, I give fuel reports and transfer fuel to maintain stability of the ship. We have saltwater tanks for ballast, which changes as we burn fuel, and I help monitor this. I check the electricity, lights, fuel, water, and AC and make sure everything’s running. I fix anything that’s breaking. Rob: As a first engineer, I am the supervisor of engine room and am responsible for how everything is operating. I get updates on the fuel status, and communicate with CO of the ship if changes need to be made. I also look at when the oil/filter needs to be changed. My position is more supervisory, and I oversee responsibilities and delegate tasks. I handle the plant and the people. Rob: I agree with Nick. Our life exists in 204ft. I am able to take frustrations and put it into things I enjoy, such as working out, reading, or playing guitar. What is something unique to being an engineer on a ship as opposed to an engineer on land? Nick: You have to have knowledge of every square inch of the ship; the two things I think about are: are we sinking and are the lights on. Rob: You have to keep things going when you have big seas, and you have to have the knowledge and ability to handle problems and stay on your feet (literally). You have everyone’s lives in your hands- you have to be on all the time. What would tell students who are looking at careers in engineering? Nick: Don’t give up and keep on fighting. Don’t let hardships get in the way. If it makes you happy, keep doing it. And know your math! Rob: it’s a limitless field; you can build anything, and fix anything. If someone else made it, you’ll have the ability to figure out what they did. You get to break stuff and fix it. Thanks gentlemen for the interview! Looked like the pipes needed a little fixing…. Welding is more difficult than it looks. Drew helping me hold the rod for welding. Look! I’m learning how to weld. Messing around in the engine room. 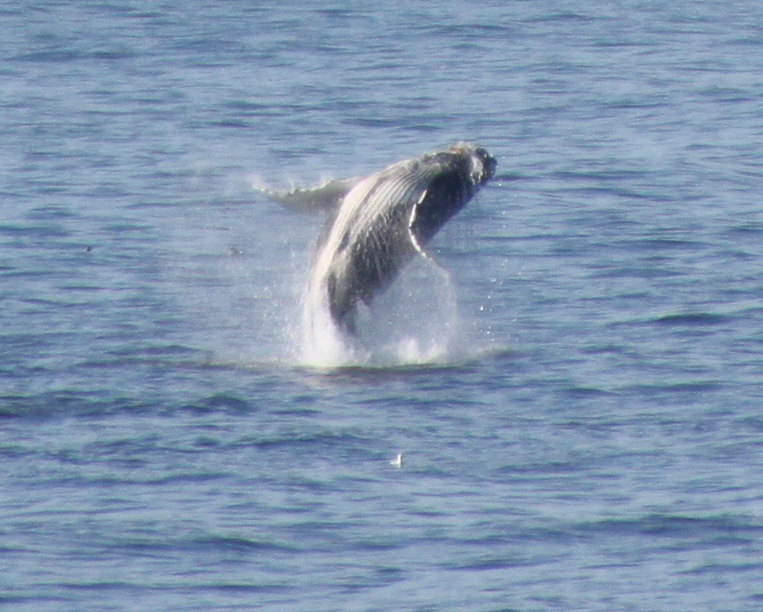 This baby humpback whale was having a blast breaching over and over again. The ringing of the phone woke me up from the gentle rolling of the ship. I had told the officers and scientists to wake me up if there was anything cool happening, and an excited ENS Gilman spoke into the receiver claiming there were hundreds (ok, maybe hundreds was a bit of an exaggeration) of whales breaching and swimming around the ship. Throwing on a sweatshirt and grabbing my camera, I raced up to the bridge to get a view of this. I had low expectations, as it seemed that every time we got the call that there were whales around, they left as soon as we got up there. This time, however, I was not disappointed. It was a whale extravaganza! Humpback whales, fin whales, orcas, there were so many whales it was hard to decide where to point my camera or binoculars. Like one of those fountains that spurt up water intermittently through different holes, the whales were blowing all around us. I was up on the bridge for over an hour, never tiring to see which one would spout next, or show us a fluke before it dove down deep, only to resurface somewhere else 15 minutes later. It was truly a treat to be able to watch them, and the weather couldn’t have been better. My favorite shot was of a baby humpback breeching – we had been tracking him for a while, his blow noticeably smaller than the adults around him. He looked as if he was just playing around in the water, enjoying himself without a worry in the world. I had been hoping to see Alaska wildlife on this trip, and am thrilled my wish was granted. A pod of orcas was amidst the whale extravaganza! The sight of the fluke indicates they are diving down deeper, and may not resurface again for several minutes. I had a question about our living accommodations on the ship, and I must admit they aren’t too shabby. I share a room with another one of the scientists, and she works the opposite shift. This works out nicely as we can each have our own time in the room, and can sleep uninterrupted. We have bunks, or racks as many refer to them, and I am sleeping on the top bunk. 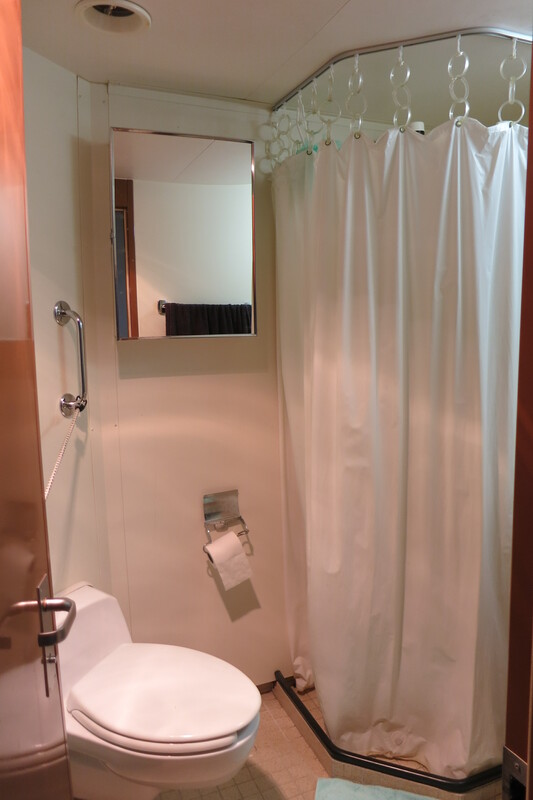 We have a bathroom with a shower in our room, and it’s nice not to have to share those amenities. 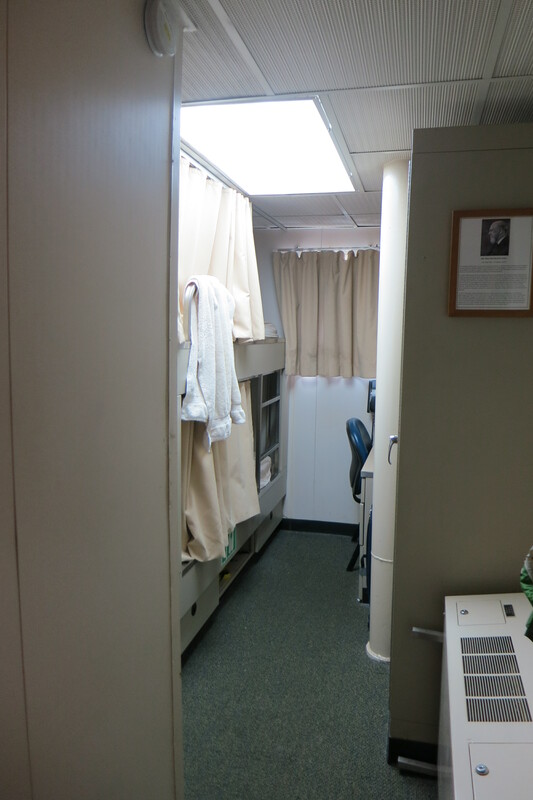 The walls are pretty thin, and the ship can be loud when operations are going, making earplugs or headphones helpful. 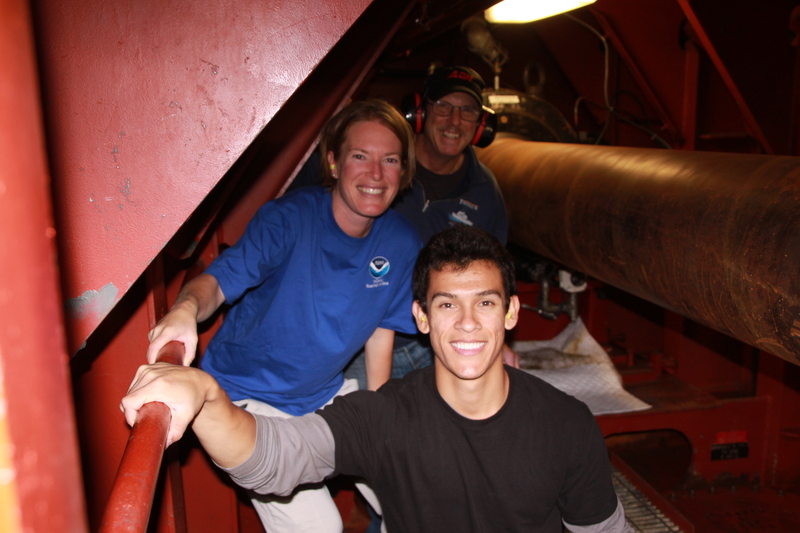 This entry was posted in 2015, Andrea Schmuttermair 2015, NOAA Fisheries Service, NOAA Teacher at Sea and tagged engineering, fin whale, Humpback whale, NOAA Ship Oscar Dyson, Orca, Oscar Dyson, Pollock. Bookmark the permalink.